In need of some inspiration for a springtime wardrobe? Our team have hand-picked their transitional wardrobe essentials, from lightweight jackets to smart knitwear. The unpredictable weather that comes with spring can make dressing a frustrating task. The answer is to opt for transitional garments, such as cotton T-shirts, lightweight jackets and delicate scarves, all of which can be easily adapted to changing temperatures. 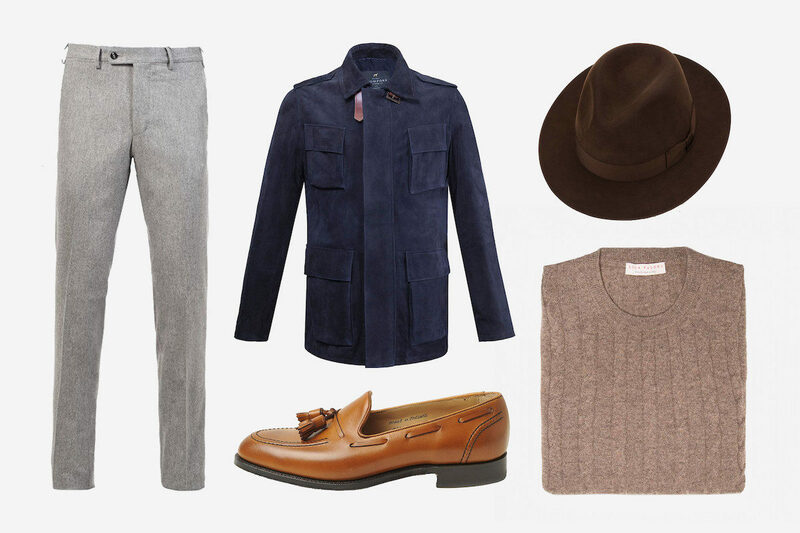 Whether expertly layering to create a tonal look or simply adding a hat as a rain-safety precaution, here are some ideas to get you in the springtime mindset. Never get complacent if the weather looks on the turn. The only thing worse than bad weather is getting caught in bad weather unprepared. So keep the layers, enough to both fend off the cold and not swelter too much if the mercury rises all of a sudden. This jacket has large patch pockets, which means you aren't left wanting storage space after ditching the overcoat. Ease off the boots and begin to register brighter colours in your footwear, and command a rakish stance with your Lock & Co. trilby. If winter is all about big, heavy coats, spring is the season of lightweight jackets that can be layered effectively. Turn to Private White V.C. for the latter, specifically its CPO wool and cotton overshirt, which was inspired by WWII-era shirts issued to Chief Petty Officers of the US Navy. You can wear it open over a white T-shirt or buttoned up for a smarter take, and its large chest pockets are ideal for storing phones and wallets. Try pairing with these light grey wool trousers by Rubinacci and a pair of minimal white leather trainers by C.QP for a laid-back, spring-ready look. The prospect of not having to go outside weighed down by heavy layers is an exciting one, even if the weather isn’t quite catering for it yet. In the early days of spring, when a few smart layers are all you need, look to lightweight outerwear such as chore coats or travel jackets, like this cotton drill masterpiece by Anderson & Sheppard. Pair with a light cashmere knit and trousers to keep any minor chills at bay – and choose matching hues for a take on tonal dressing. We are in the 89th week of the deepest, darkest winter in London and the sun has remained asleep for 99% of the time. As warmer weather approaches, layer up in pieces that you can peel off in the eventuality of high summer between snow storms. By this, I don’t mean swim shorts under your thermals. Go for something like Falke's grey knitted trench coat: it’s casual, great for travelling in and for throwing on and off. It might also just protect you if an Ice Age decides to kick in. Wear with Falke's cashmere hoodie, which is sleek and can be worn underneath something, and this navy Naked Clothing T-shirt because it's smart and casual. The one thing that is (hopefully) guaranteed with spring is the sunshine. No matter how brief and no matter how little warmth it provides, it offers the perfect opportunity to dig out those neglected sunglasses from wherever we abandoned them after the summer holidays. A pair of Wayfarer Ray-Bans undoubtedly fits the bill here, and make the perfect accessory to a casual ensemble – style with Blackhorse Lane's E17 chore coat and Calabrese 1924's red and green medallion pattern wool scarf. Apparently, the first official day of spring was on Tuesday, which is news to us all in England as the woollen hats and scarves are still firmly on display. That being said, I’m an optimist and feel like spring could be about to show face. For me, that means it's time to dust off those timeless suedes, or invest in one, such as this A1 jacket in rich tobacco by Chapal. The horn buttons, knitted collar, cuffs and waist and front patch pockets take inspiration from its militaristic heritage, yet it's kept modern with a sheepskin leather suede body and a slimmer silhouette. Pair with a long-sleeve cotton top (it’s not summer yet) and some good-quality sneakers for a relaxed and effortless get-up.